With summer quickly approaching thoughts of the beach, bbqs, the pool, the zoo and all things outdoors are on our minds. For safety’s sake rehydration needs to be on our minds too. Our children are at such a high risk of dehydration. Sippys and bottles of cold water need to be on hand at all times. Why not make that chore a bit more fun. 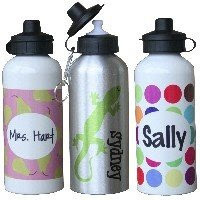 Victoria P. Zurcher Designs carries a fun and funky selection of personalized Aluminum Water Bottles. With designs including argyle, FlipFlops and skulls there is a going to something for every kid you know. Available in white or silver finish, these water bottles are a safer alternative to plastic. VPZ Designs water bottles are personalized with your child’s name, nickname or even their sports team name. Not a decal, the personalization is fused onto the bottle to ensure permanence and withstand durability. Holding a substantial 20 ounces of liquid, these bottles are dishwasher safe and come with 2 different caps and a carabineer to hook to diaperbags, strollers, backpacks or purses. Victoria P Zurcher carries a HUGE selection of cool and fresh products that make great gifts for kids, teachers, bridesmaids, coaches and co-workers. Victoria P. Zurcher Designs is giving Summer Party attendees the chance to win one of 2 personalized Aluminum Water Bottles for their own little one! Follow the rules on how to enter below and put your entry(ies) into the form!